Os grid ref: TQ5547 5868. 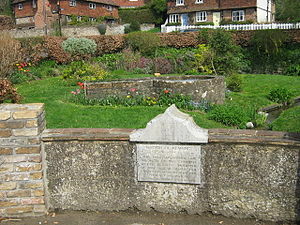 St Edith’s Well can be found close to the High Street in Kemsing, Kent, 3 miles from Sevenoaks. Built into a wall at the side of the street there is a plaque with an inscription, and in the garden behind is the famous holy well of St Edith of Kemsing, a 10th century Saxon nun. She was, according to legend, the illegitimate daughter of King Edgar and Queen Wulfthryth. The restored and nicely-kept well has a rather odd-shaped walled structure surrounding it and a metal grill covering the water. Some steps descend down into the well which, it was claimed, had miraculous healing powers; indeed soreness and irritation of the eyes has been cured here and the well has been a place of pilgrimage since medieval times. On the wall plaque at the front of the well the inscription reads:- “St Edith of Kemsing AD 961-984. This well lay within the precincts of the convent where St Edith, daughter of King Edgar passed her childhood, and hallowed by her presence its waters became a source of healing”. The town’s signboard shows Edith as a young girl leaning over her well. There is, however, some uncertainty about St Edith’s life. It seems she spent her childhood in a convent in Kemsing, but when she was older she was sent to a convent at Wilton where she remained until her death in 984 AD. She always refused to become the abbess of Wilton, or any other religious house, leaving the position at Wilton (c978) to her mother, Wulfthryth, instead. Edith would not even consider becoming queen upon her mother’s death, even though she was put under great pressure. We know that a number of miracles were wrought by her great holiness, but austerity and devotion to God was always at the forefront of her time as a nun. She was also known for her charities to the poor and for her love of wild animals. After her death at the fairly young age of 23 miracles occured at her tomb and a shrine was set up in Kemsing to which pilgrimages were established, with her well a focus of healing. Her feast-day is held on 16th September and a procession still takes place in the town on that day. Categories: Holy Wells, Kemsing, St Edith's Well | Tags: Holy Wells, St Edith's Well at Kemsing in Kent | Permalink.